Every so often commentaries converge as such that I’m compelled to connect the smallish number of dots. I have done it once before here. Meiselas is a curator for the Moving Walls project. The exhibition features work by former Open Society fellows and prison photographers Joseph Rodriguez, Steve Liss and Andrew Lichtenstein. It is fair to say that the Open Society’s Documentary Photography Project has a propensity for prison photography projects. The 17th round of Moving Walls fellows has just been announced, and of the seven recipients, two document the lives of the incarcerated. Lori Waselchuk for her work at Angola’s prison hospice and Ara Oshagan for his coverage of juvenile detention in California. One last note on cages. Meiselas’ selection includes images from Eugene Richard’s Procession of Them produced as a book in 2008, see spreads here and listen to Richards speak on the project as part of Columbia University’s “Photography as Advocacy?” series (2006). One task of prison photographers is to emote the isolation and hardness of incarceration. It is a difficult task. Richards, while not looking at prisons per se is a master of conveying the barbarity of the cage and the helplessness of the caged. And besides, in today’s discourses that prefer not to distinguish institutional forms, the mental health asylums of Richard’s work are prisons. James Pomerantz highlighted the work of Antonio Vega Macotela who began investigating the concept of time as that controlled by outside forces and ended up clocking over 500 hours in the Santa Martha Acatitla Jail, Mexico. Read the essay, it’s an eye-opener! This reminded me of Marc Steinmetz‘s work from Germany from a few years ago, which I mentioned last year. 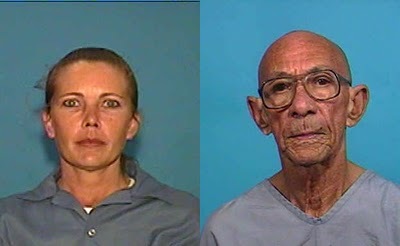 iheartphotograph highlighted the institutional mugshots presented online by the Florida Department of Corrections. This is the first example I am aware of that a state DoC has provided a publicly accessible online search of full profiles and photographs of housed inmates. No details are excluded; vital stats, aliases, crime, date of crime, body marks, date of release. I suppose this is the voyeuristic bridge between DOC internal databases and the ever-refreshing scrolling “news” galleries of persons recently booked. The adoption of police mugshots as “news” also came out of Florida, so there is obviously research to be done there into Florida’s culture and visual rhetoric of criminal justice. In both these cases, the public is being drawn in – by a limited amount of information – to the mechanics of regional sheriffdom. Most wanted lists, such as that in California that just got a flashy website overhaul, carry some logic in that they inform a public about a potential menace at large. I expect there’d be a public outcry if this service was removed. Accepting that logic, though, it is curious as to why criminal justice agencies would provide mugshots of booked and detained persons. All told, the availability of state prisoners’ photo IDs makes sense if you consider such databases as deliberate tactic. The databases become other arms in the apparatus of the panopticon; the visage of the prisoner is policed online by the gaze of unlimited number of people, as readily as it is policed by the prison guards’ gaze within the walls. While mugshots have commonly been released at intervals to the media, particularly of infamous prisoners, never before has a photo-database of society’s transgressors been so accessible and searchable by the public. We have become nodes in a network of observation and discipline.